As I mentioned in a previous post, Acute Records has released Music For Neighbors, a compilation of recordings by the legendary but obscure Feelies related band The Trypes. I wanted to say a bit about the release, because in every respect it is extraordinary. I've been waiting for this music to be released for decades, even though I didn't know most of it existed until a couple weeks ago. Fans of the Feelies and the Hoboken scene of the 80s in general will no doubt feel the same way. Liner note author Ira Kaplan calls the album a "heretofore secret history of The Trypes," and that's about as good a description as I can think of. Outside of a very small circle of those with close ties to the Hoboken scene of the 1980s, very little was know about the Trypes until now. The band released one EP, The Explorers Hold, on Coyote Records in 1984 and a single track on a Coyote compilation. That, and the fact that the band was home to members of the Feelies and Speed The Plough, was about all that was known of the band to all but a select few. The EP itself was remarkably hard to find. I can count on one hand the number of copies I've seen in record stores over the years. I still remember my excitement upon discovering a copy after years of searching in Hoboken's legendary and much missed Pier Platters record store. Those five previously released tracks comprise side one of the new LP release, and make for an extremely compelling listen. This gently hypnotic, lighter than air, psychedelic indie rock might barely register in your consciousness the first time you hear it, but once you have, it will be lodged there forever. Side two of the record came as something of a shock to me. This was the work of an almost entirely different band, consisting of demos from a smaller, earlier version of the group fronted by a guy named Elbrus. The extensive liner notes with commentary from Kaplan, Glenn Mercer, Marc Francia, John Baumgartner, barely mention anything more than a single name for him; Elbrus. His full name, it appears, was Elbrus Kelemet. What happened to him? Some things, it seems, must remain a mystery for now. Baumgartner has only the following to say on the subject: "Somewhere in here, Elbrus left the band, or was dispatched, the details at this point aren't really important." So, who was Elbrus? From the sound of the demos he may have been The Boy With Perpetual Nervousness. 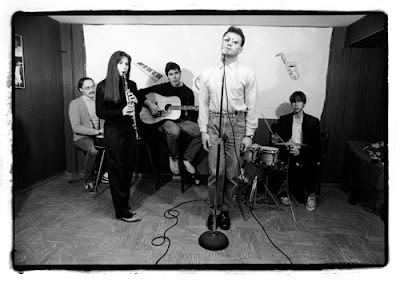 In distinct contrast to the later incarnation of the band, where various band members took turns on vocals that never attempted to do more than gain (slightly less than) equal footing with the music, Elbrus' vocals are up front and center and have a nervy, paranoid tone to them on songs like "Belmont Girl Is Mad At Me," and "Foreign Doctors." You'll have to forgive the facile comparison, but his vocals do bring to mind David Byrne's early work with Talking Heads. The music is harder to characterize. It's very minimalist in texture, and the arrangements are far more stripped down than the previously released music. One of the dominant instruments is a cheap, wind-driven plastic organ played by John Baumgartner that sounds strangely beautiful. I can only imagine how difficult it must have been to coax compelling music out of such an instrument, but Baumgartner succeeds brilliantly, as does the whole "less-is-more" aesthetic. Comparisons to other post-punk minimalists like the Young Marble Giants come to mind, but don't fully convey the weird and wonderful vibe to the music. The record gets really interesting when it isn't even a record anymore. Sides three and four of what could have been a double LP set are virtual, and available only as downloads. This is a perfectly justifiable decision in light of the sound quality of what follows (mostly rehearsal and live to cassette recordings), but absence of a physical artifact to go with the music should not be confused with the absence of quality music. In many ways these rough demos constitute the most rewarding music on the set. 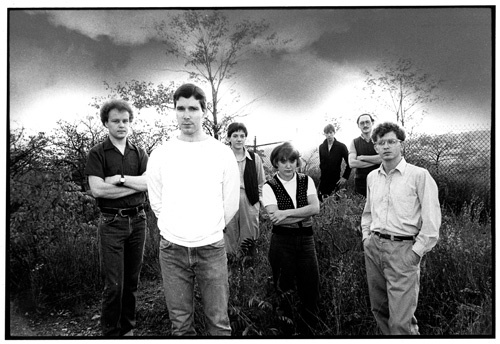 Songs like "Dark Continents," "Hard Friend To Keep" and "Running On" may take a little longer to sink in due to the rough sound quality, but they lead to the inevitable conclusion that we may have lost as much as we gained when the Feelies re-formed in 1986 and the Trypes went on (permanent?) hiatus. I can't praise this release from Acute Records highly enough. It is everything you could hope for in an archival release of this nature. Not only does it collect everything the the Trypes released during their too-brief lifetime (which in itself is a big deal given the relative rarity of this music up until now), but it adds more than twice as much material previously known only to a small circle of friends (or perhaps neighbors). The LP has been lovingly packaged with a hand-letterpress-printed cardstock sleeve and a composite band photo attached with photo corners, and includes an outstanding booklet that sheds much new light on the heretofore mysterious band. In the process it reveals that the Trypes were so much more than just the "Feelies side-project" they are sometimes referred to as, but in fact are one of the great lost bands of the 1980s. LA Times: Hello Spotify, Goodbye Vinyl?